To mark the 65th Macao Grand Prix, in addition to issuing the commemorative stamps, Macao Post and Telecommunications Bureau will launch a thematic pack, covering the philatelic products from the 50th, 60th and 65th of Macao Grand Prix, as well as the 50th Macao Motorcycle Grand Prix. 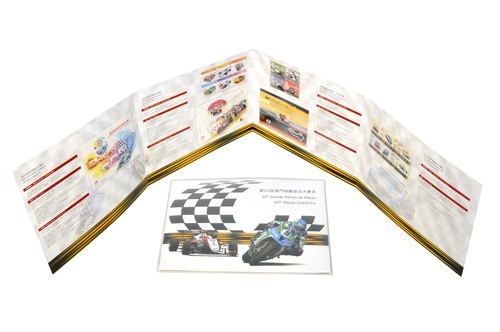 This product enriches the collections of philatelists and motor sport enthusiasts. This presentation pack will be available for sale on 15th November, at the Philatelic Shop of General Post Office, “Rua do Campo” Post Office, Maritime Ferry Terminal Post Office, Airport Post Office and from 19th November at the Communications Museum. The selling price is MOP150.00.